A compact, fun-filled paperback book that features entertaining facts and insights about life, love and the law! Not many books can address quitting your job or going to small-claims court -- then recommend watching "Office Space" or cover how cases end up before Judge Judy. Covering everything from birth to death, starting a business, buying a car, renting an apartment, and everything in between. 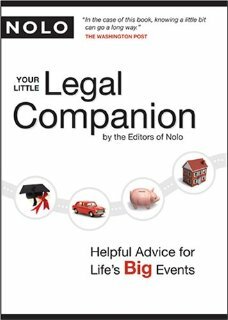 Turn to Your Little Legal Companion for quick, practical and just plain friendly advice from the experts, the editors of Nolo, America's leading do-it-yourself legal publisher. Makes a great gift! Your Little Legal Companion, Nolo's most engaging book yet, does this and much more! Covering everything from birth to death and everything in between in an easy-to-read format. Turn to Your Little Legal Companion for quick, practical and just plain friendly advice from the experts, the editors of Nolo, America's leading do-it-yourself legal publisher. A quick read that's guaranteed to make you laugh, it makes a great gift, airplane book and -- yes, it must be said -- bathroom reader!